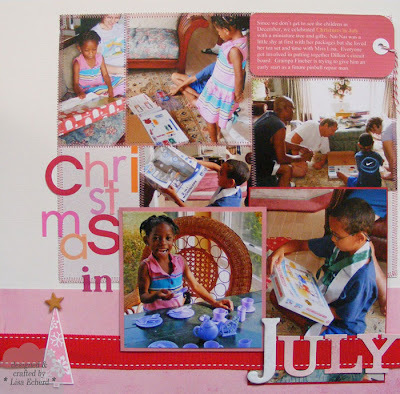 The day after Valentine's and here is a layout about Christmas in July. If think you are Alice in a Wonderland of Seasons, welcome to scrapbooking. If I do a seasonal page, it is usually several weeks or months past the event. This isn't all bad. The good part is that you get to relive the event when it is refreshing. Summer pages make you warm in winter and look forward, even more, to spring. Snowfall pages or autumn leaves cool down a hot summer day and make me long for my fall wardrobe. 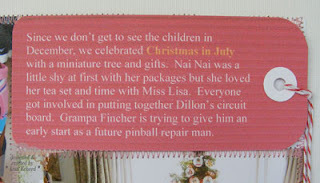 This is the first layout in a series about my stepdaughter and family's visit last summer. Since we don't see the kids during the holidays, we wrapped up Christmas gifts, pulled out a small tree and did Christmas in July. It was a lot of fun and they really appreciated the gifts. 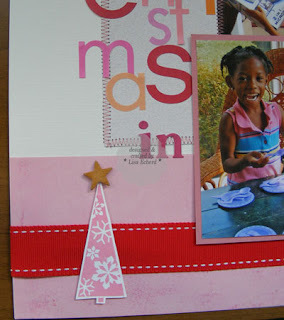 I was stumped on the best way to arrange these bright photos and turned to Splitcoaststampers challenge to guide me. The layout suggested a single photo or digital collage for the background. I already had the photos printed so I did the collage with machine sewing between each photo. The pink and red colors were pulled from the photos. Perhaps Valentine's also had a wee bit of influence, too. And as I write this, it is pouring the snow down - again! Maybe those snow pages will look great when I get around to them next July. Ink: Rouge fluid chalk by Colorbox; More Mustard and whisper white by SU!